This script is based on the Castlevania: Curse of Darkness system. It allows you to specify 1 or more recipes per item made. For instance, 2 ways to make a 'Full Potion'. Set up 1 or more recipes per item. You can set up if the menu automatically update (or not) if you have the items to craft a new item. You can set this to be 'recipe based'. The instructions are in the script. I know of no known compatability issues. Please, credit Leon for this script, but I in turn, credit Tiberius_XXVII for teaching me to script. Lol I miss read it and was like, WTF call of duty didn't have a crafting system did it? Nice script though! I sincerely apologize with the demo's upload location. It has been changed from RMXP_Unlimited, to mega upload. If anyone cannot get it from there, please, PM me. I'll be more than happy to send you the demo. I have posted a new url using filefactory instead of megaupload. Just a small update. It's 50000 characters if I'm not wrong. I can increase it if Leon needs it, though. download link down, please reupload. I don't have the demo, but here's the script for you. 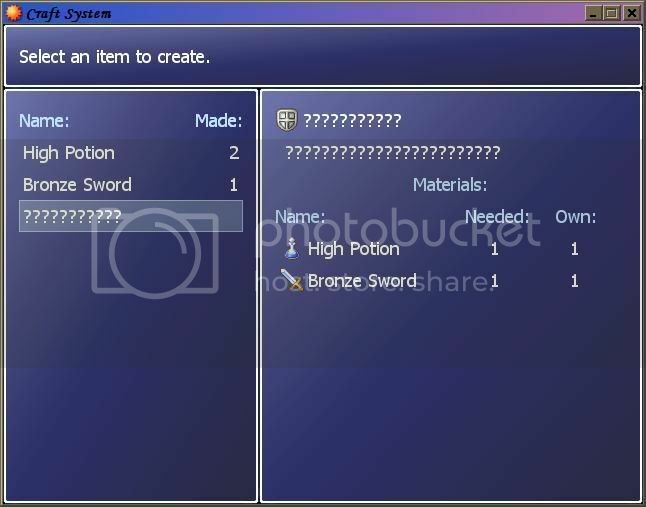 # By default, if the player has the items for a recipe, they will learn it. # You can set some to be triggered by events. # Put below all default scripts, but above Main. # Follow the examples in the module, and put in the numbers where needed. # it is the easiest way to make it usable without too much coding. # Set each item to be 'evented'. # Tells which item recipes are evented. # Tells which weapon recipes are evented. # Tells which armor recipes are evented. # Used to record what items have been made. # Used to show availible item recipes. however, what do I do with it? Do you use a tidbit of script to call this scene, like blizz's stat distribution thing? This seems like a nifty idea, but I'm just too inept to grasp it from this point. Can someone tell me the secret? This is a great script, by the looks of things, but the demo's down and the script doesn't have a $scene_new craft thingy or anything. No instructions on ACTIVATING it at least. You may as well hand me a locked suitcase and tell me everything I need is inside it. An indestructible suitcase. It's impossible to use in its current state. Anybody mind sharing its secrets so it can be used? Thanks for the script snipet, Juan. Sorry I took so long to reply, I've been away from Chaos Project for a while. I tested it already and it worked, so you've honestly saved me a crazy amount of trouble. THANK YOOOU!! !